A CREATIVE flare for hair put a young Chobham stylist among the enviable elite when she took first place in a prestigious national competition last week. The design techniques of the Velvet Rooms’ talented 24-year-old Emma Browning coiffed her way into the top slot in this year’s illustrious L’Oréal Young Colourist contest. At a glittering ceremony held at the glamorous Grosvenor House Hotel, the venerable salon team were thrilled when they heard Emma’s name announced as the region’s overall winner. One of the girls said that she had looked like a rabbit in headlights. A fortnight ago the News & Mail featured Emma when she was one of only five shortlisted – in the 59th year of the competition – for the southern region award out of an incredible 2,000 participants. The brief has been to create a female look for autumn/winter 2014 that demonstrates a wearable, commercial, fashion-led high-street colour and finish. Then last week, tension and excitement of the top-notch team was in evidence when they turned up on tenterhooks to one of the most important events in the hairdressing calendar. Hosted by TV’s Caroline Flack , the awards also celebrated the L’Oréal Colour Trophy 2014, the best of men’s styling, and afro looks. Ireland’s Dylan Bradshaw kicked-off the evening, wowing the audience with his new editorial collection, while well-known names in the industry – Richard Ward, Toni & Guy, Charles Worthington, Rush and Trevor Sorbie – all bowled over the guests with their amazing catwalk inspired looks. 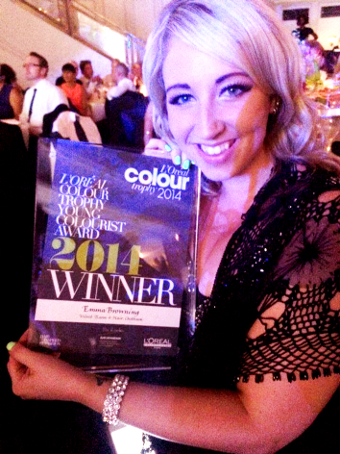 But for the Velvet Rooms team, the event was all about the crowning of the Young Colourist 2014, and Emma proved she can get ‘ahead’ in the industry when she dreamed up her Tri-Dye design. Her gorgeously glossy, deep and colourful crowning glory topped the lot. Emma now has a whirlwind year ahead of her. While continuing to perfect her skills at the Velvet Rooms, she will also be under the wing of the creative team at the L’Oreal Professional Colour Academy, giving her an exclusive experience money just can’t buy. Her fantastic career opportunity includes a comprehensive one-year development schedule educated by some of the UK’s top colourists.